Not to be confused with Emissoras Pioneiras de Televisão. Channel ground logo since 1986 (EPTV). 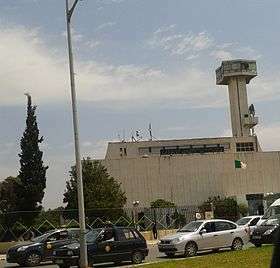 Public establishment of television (EPTV) (Arabic: المؤسسة العمومية للتلفزيون‎‎) formerly National Foundation for Television (ENTV) (المؤسسة الوطنية للتلفزيون) is the Algerian national public television network. And the company's products : Algerian Television, Canal Algérie, Algeria 3 , Algeria 4 and Coran TV 5. ENTV broadcasts in Arabic, French, and Berber. ENTV has produced 2002 Nass Mlah City comedy TV series (English: Good People City) and 2004 and 2005 sequels Nass Mlah City 2 and Nass Mlah City 3. ENTV was the only television channel until 1994, when French-speaking Canal Algérie was created. Canal Algérie is available in Europe on Eutelsat satellite service (Hotbird and Astra). It is also available on French Numericable and Monaco MC Cable cable television services. On 5 July 2001, ENTV lunched a new channel in arabic language for the Arab world to give an institutional image of Algeria. On 28 October 2015, the channel has started broadcasting its programs in HD. On March 17, 2009, ENTV launched a new Berber language channel called TV Tamazight, also referred to as Algérie 4. The channel offers programs in Kabyle, Chaoui, Tumzabt, Chenoui and Tuareg. ↑ "La télévision publique A3 passe en HD". L'Expression. Amira Soltane. December 6, 2015.